I was honoured to officially open three new classrooms in November at the Citywest Educate Together School, as its roll reaches 290 children. The new classrooms are an investment in our children’s future and our communities’ future. Citywest Educate Together has come far since its opening four years ago, and I would like to acknowledge the hard work of the staff and parents, the open and welcoming ethos of the school is an example for others to follow. 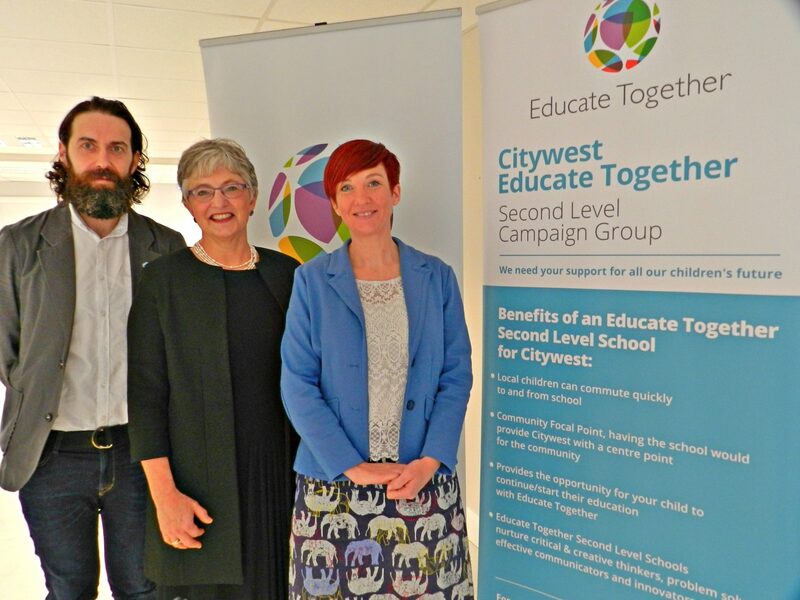 Minister Zappone would like to take this opportunity to thank the commitment of both the parents and teachers in Educate Together, Citywest, pictured above with the Minister is parent, David Murphy and school Principal, Caitriona Hand. The energy, commitment and passion of all who attend this school is to be admired and applauded.These new state of the art classrooms in the existing building which have been supported by the Government come as architectural planning commences for the new school building. We all look forward to the day when that 16 class new building is a reality. There was another cause for celebration when Educate Together was named as patron of a new secondary school in Firhouse – and that news has been warmly welcomed there. Classes are due to start in 2018 with student numbers eventually to reach 1,000.